I found an amazing recipe using healthy ingredients. I bought a large bag of Sweet Potato’s and I needed to find different ways to use them. 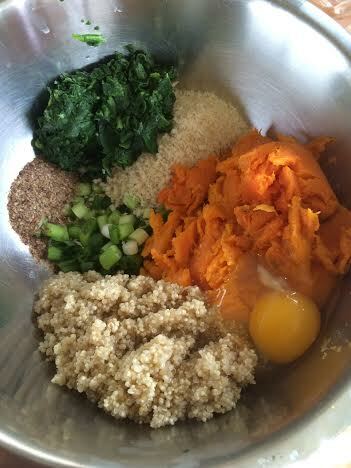 After some search through Pinterest I located this delicious Sweet Potato with Quinoa and green veggies recipe. 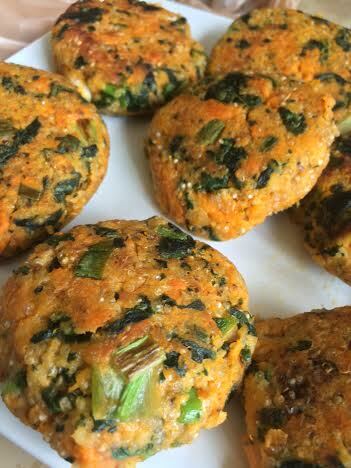 I made a couple of adjustments for my own flavor taste- I switched out Kale for Spinach- just preference and I used 1 egg and added in Flax Seeds and Green Onions. I used Coconut Oil – just 1 Tablespoon. These will be soft- and you need to carefully remove them from the pan- you can easily cut into them with a fork or spoon. I didn’t use cornmeal in my recipe it will probably give it a more crunchy type of flavor. I loved this so much I”m going to work it in every week- makes a perfect side dish and can be a quick pack and go lunch. :)) I found this recipe from Yes, More Please food blogger. 1 cup cooked Quinoa, you can use red quinoa if you prefer. Approximately 1 cup of uncooked quinoa yields 2.25 cups when cooked. ½ cup panko or any kind of plain bread crumbs. If you have gluten allergies, ground old fashion oats or almond meal will work. 4-6 tablespoons grape seed oil, peanut oil, or coconut oil to pan fry them.